In this post: If you’re not so into ordinary builder’s grade rooms, here are 12 tips for transforming a bland powder room into a lovely French bathroom. 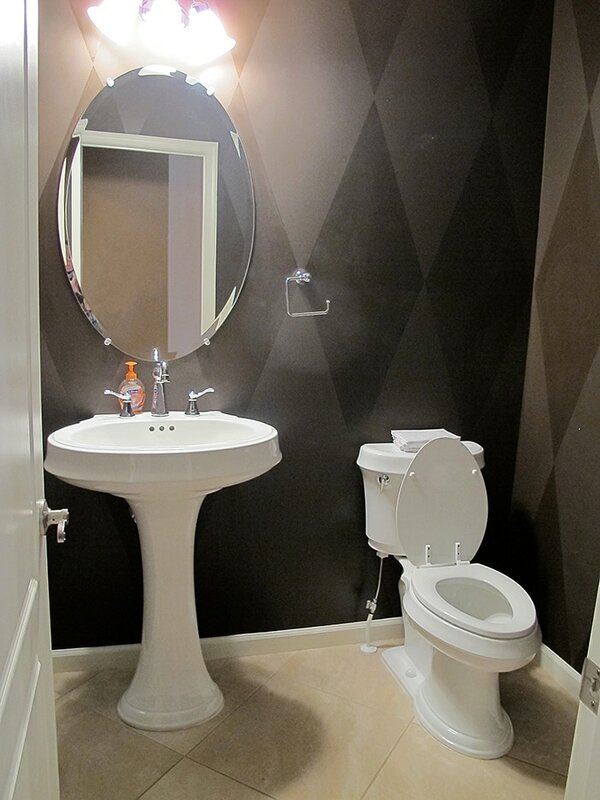 How often have you seen those powder rooms typical in new development homes? You know the kind ~ new but characterless fixtures, builder’s grade faucets, bland floor tile, common sconce and mirror and little else. Often they throw a rich paint color on the wall, hoping it will mask the ho-hum feeling of the room. Such was the state of our powder room when we moved in 6 weeks ago. Here’s the before pic below. With an entire house to make feel like home, we weren’t prepared to do major renovations in this space. The goal was to transform the room without spending much. 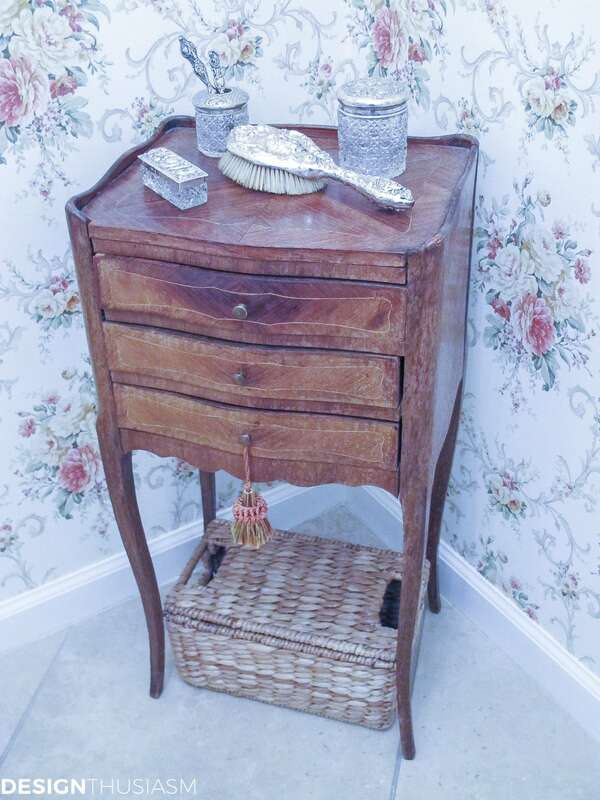 The sink and commode were innocuous enough, although this particular pedestal sink provided nowhere to put soap, while the extra tall height left no space for a shelf. I’m not a huge fan of the ceramic floor, but ripping it out will have to wait for another time. So instead I addressed the key things that would make the biggest statement and go the longest way towards expressing my style. 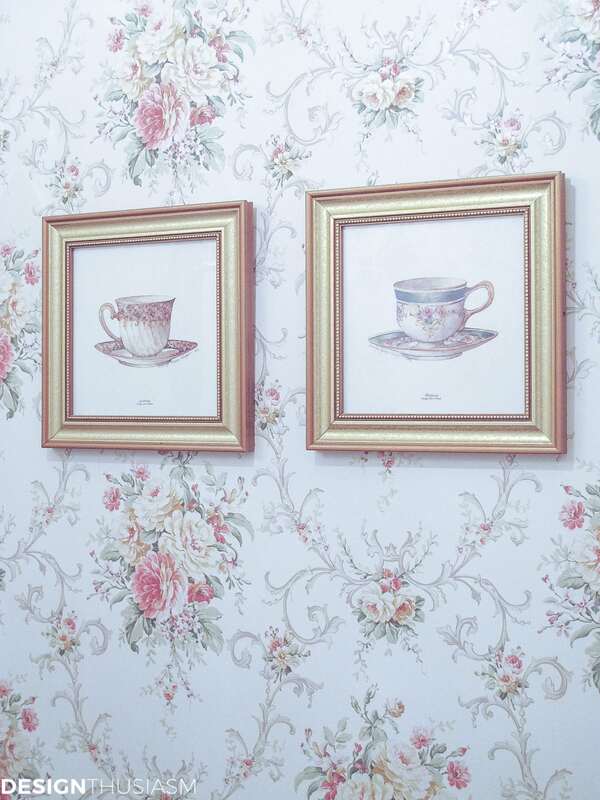 The single biggest transformation toward a French bathroom was achieved by getting rid of the nearly-black painted walls and covering them with a lovely toile. Wallpaper is not for everyone and if floral isn’t your thing, you’d want to pick something else, but in a room this size without windows, rug or seating, the use of wallpaper affords the opportunity to bring in pattern and personality to define your look. In a tiny room, the expense of the paper is balanced by how little you need. 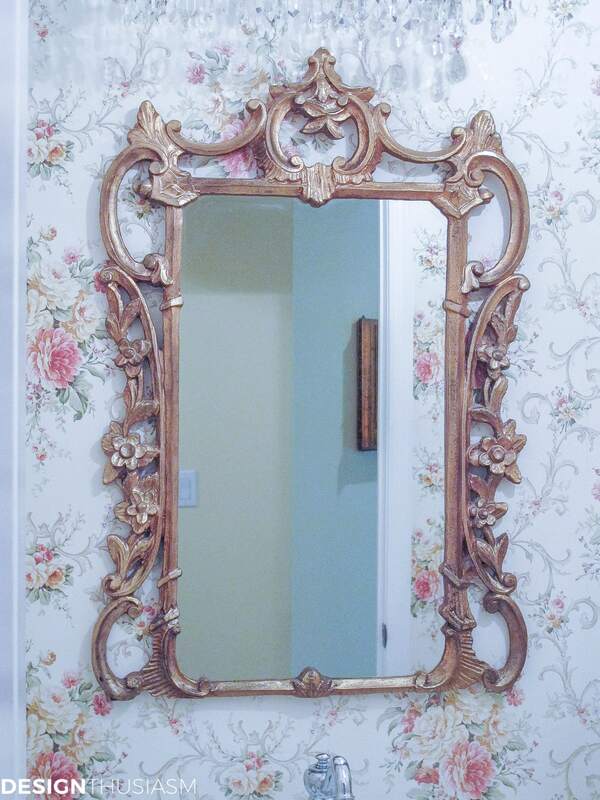 A beautiful antique French mirror is just the thing to make any room special. But in a pinch, a lightweight resin reproduction will get the same point across. If you’re lucky enough to have the space for it, a tiny piece of furniture adds both character and a place to store hand towels, aspirin and other guest necessities. Mine hold bandaids and lip balm, and the wicker basket beneath is a discreet holder for spare toilet tissue. The place to really have fun showing your personality is with the pieces you choose to display on the limited surfaces you have to work with. 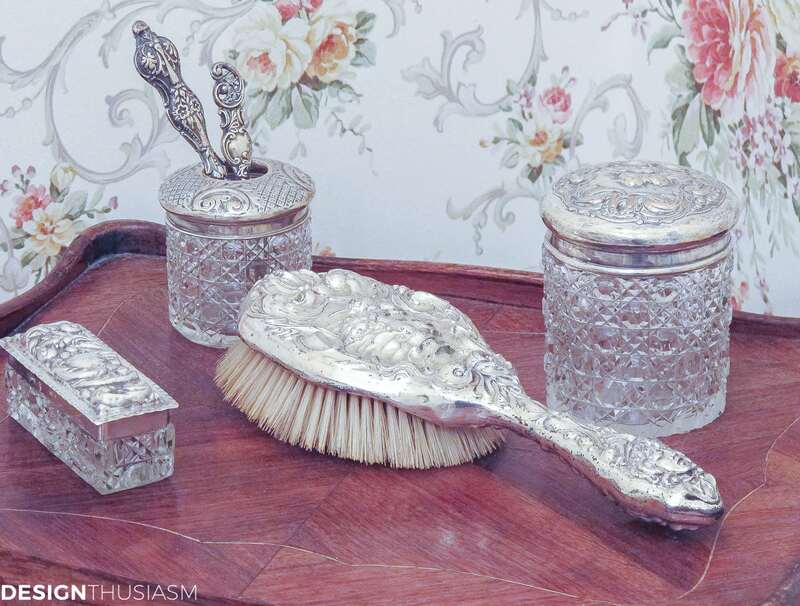 These are part of my collection purchased mostly in England and add a fun touch of glimmer and refined appeal. The hand towels are another spot where you can add a bit of flavor without breaking the bank. I enjoy a mix of patterns so I went for the cheetah print, and this is where we took the opportunity to address the lack of a shelf, adding towel bar and shelf, all in one piece. I’d prefer it to be closer to the sink, but for now this will do. Many of these bathrooms come with cheap dome lighting, but ours had NO overhead lighting. 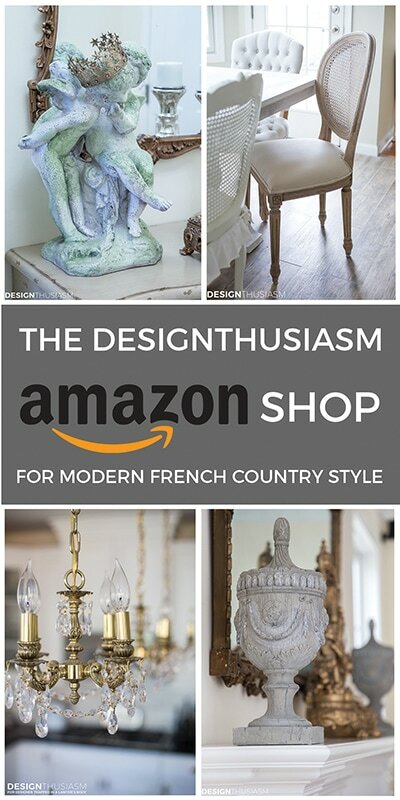 Either way, bringing in an antique piece or one with special character is a great way to make your room one-of-a-kind. This lantern was in the entry hall in our old home and easily transitioned to its new role. One of my first collections began with many assorted teacups, but as the collection grew faster than the furniture I could display it on, I began to branch out into paintings of the china. The colors here are a perfect blend with the paper. While we don’t really need two light sources in this room, we did need to deal with the existing wiring above the mirror. An inexpensive sconce was added to the mix and the change from the original is like night and day. Finding new uses for older things is a great practice. 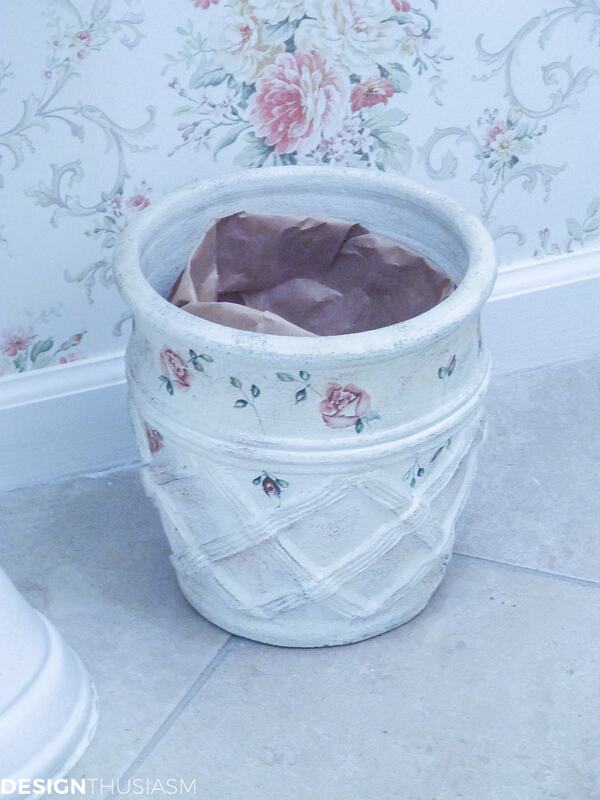 Here I used a pretty planter to serve as garbage can. It fuses seamlessly with everything else in the room. 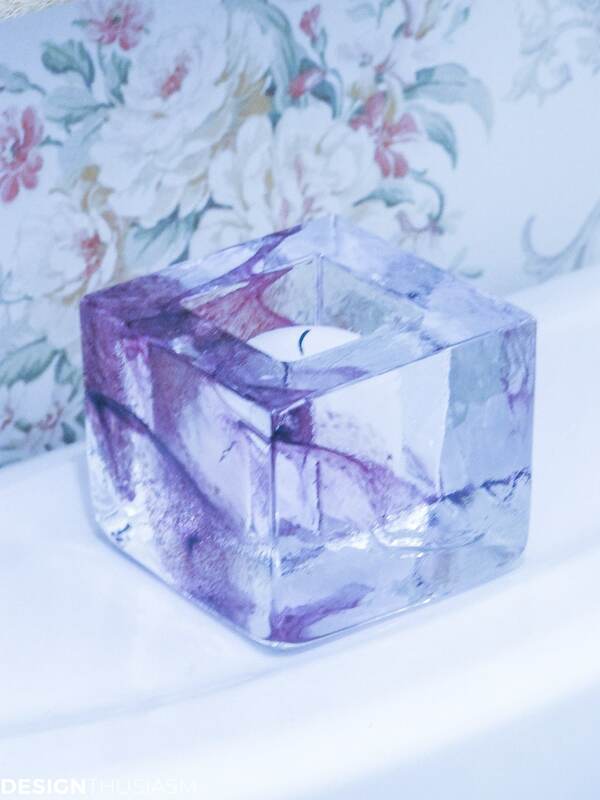 The gorgeous square votive holder adds a punch of color, as well as a taste of luxury to offer your guests. I always light it when entertaining at home. 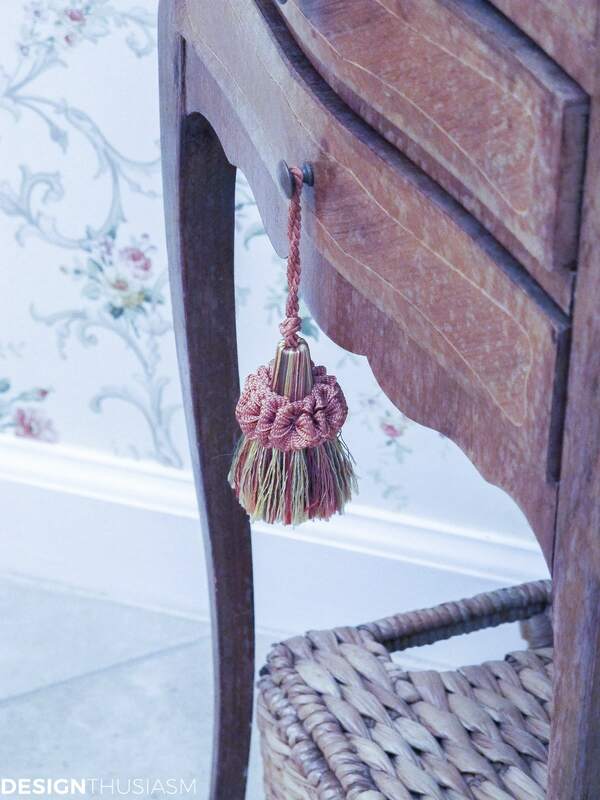 Hardly the most essential thing in the room, but a lovely addition to my French bathroom nonetheless, this sweet little tassel proves it’s all in the details. 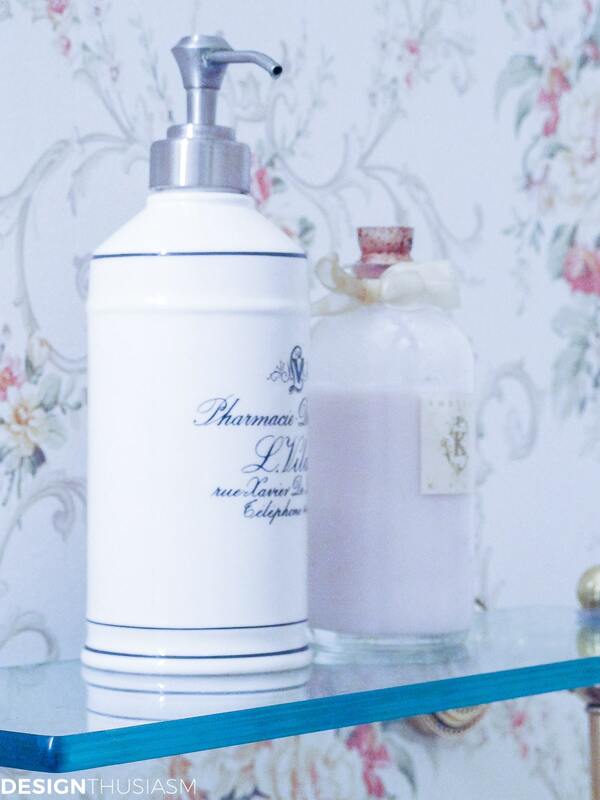 A final bit of pampering can be enjoyed via the hand soap dispensed in a French apothecary jar and a pretty aromatic hand cream, served up on the shelf. A pretty big transformation, without ripping anything out, left us satisfied for now… until the next project. That’s a beautiful transformation. Love the softness along with the elegance. Love it!!! Your powder room is so elegant. Love the light fixtures. Thanks, Kim! We did have to add the overhead, but it was a simple fix. 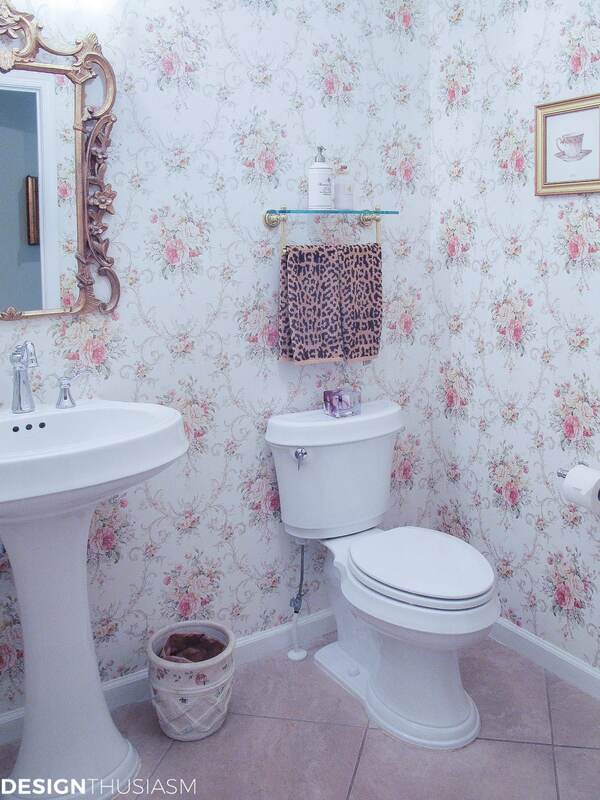 Ha ha, yes, I actually already ordered new towels last week… 🙂 I’m generally partial to a mix of patterns, but the floral I had in my old powder room was bolder and worked better with the cheetah print. In an effort to keep the concept of something special on the towels, I went with a monogram. Will post the update once I receive them. Thanks for visiting! I really wish I knew what went on in builder’s minds sometimes. The construction of this Powder Room is a clear indication that this designer doesn’t even wash his hands when he leaves the bathroom! Well, at least you have a nice commode. That looks like a comfort height, which I really prefer. Love your wall paper, and your solution for the extra rolls of TP is perfect. I think you will need to address the soap issue sooner rather than later, though. I’ve seen some wall-mounted soap holders and you might be able to find one to squeeze under the mirror. I don’t think keeping the soap way up in the shelf is going to be functional. I’m more of a form-must-follow-function kind of gal, as you can see. Your little table is cute and the tassel is truly gorgeous. Yes, the soap and towel issue has been a challenge. Initially I hoped to put the towel bar with shelf to the left of the sink, so it was right next to it, but it was a little too close and felt like you were walking into it. Ultimately I’ll want to replace the sink – it drives me nuts that is has absolutely no “counter” space. It’s also too tall for my comfort and I hate the silver faucet. But that will likely wait until we replace the floor. For now, I put paper hand towels on the sink when we’re having guests, but that’s an awkward and temporary solution. Ha! No, I didn’t notice the lever until just now! That would drive me batty as well. But, hey, at least your fixtures are white. Imagine the challenge if you had to deal with colored fixtures! Thank you for allowing your followers to nit pick your truly fabulous designs. For me, at least, it’s an education and a delightful indulgence to see your taste come to life and I look forward to your every post. Hi, Lory. Your powder room is heavenly! I love wallpaper in the bathrooms–easiest way to make a big statement. Your light fixture is gorgeous, too. 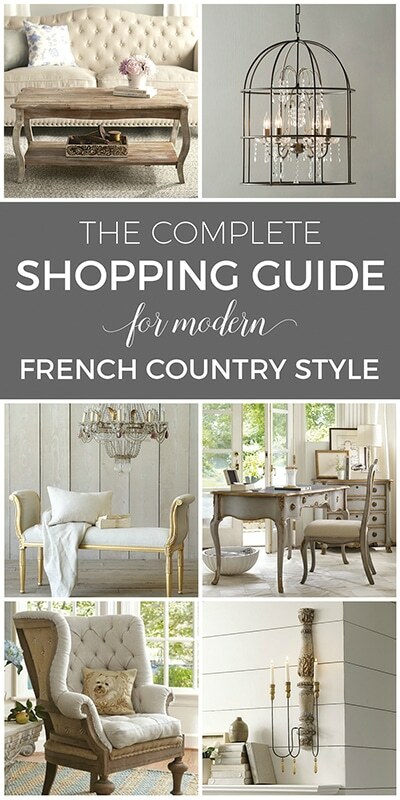 Now that the lighting stores carry mainly contemporary fixtures I am having such a difficult time finding French and Colonial fixtures. 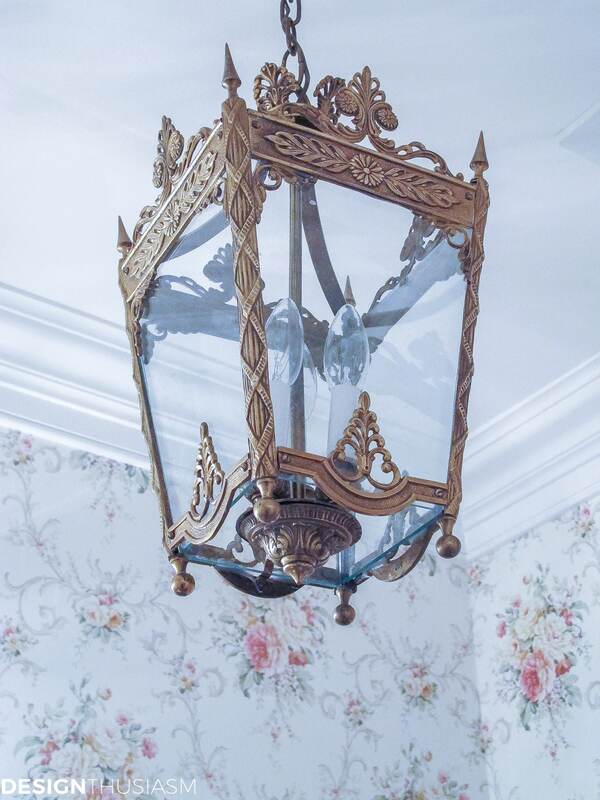 Your light looks antique, but do you know of a good source where I could purchase a similar new one? Any advice would be soooo appreciated. Hope your day is a lovely one. Thanks, Bobbi! Yes, the overheard lantern is antique. I love the look of antique lighting, but I often then have the issue of flickering bulbs in not-quite-perfect sockets. For new lighting I go to a store called Capitol Lighting. They are here in NJ, but do sell online, as well. 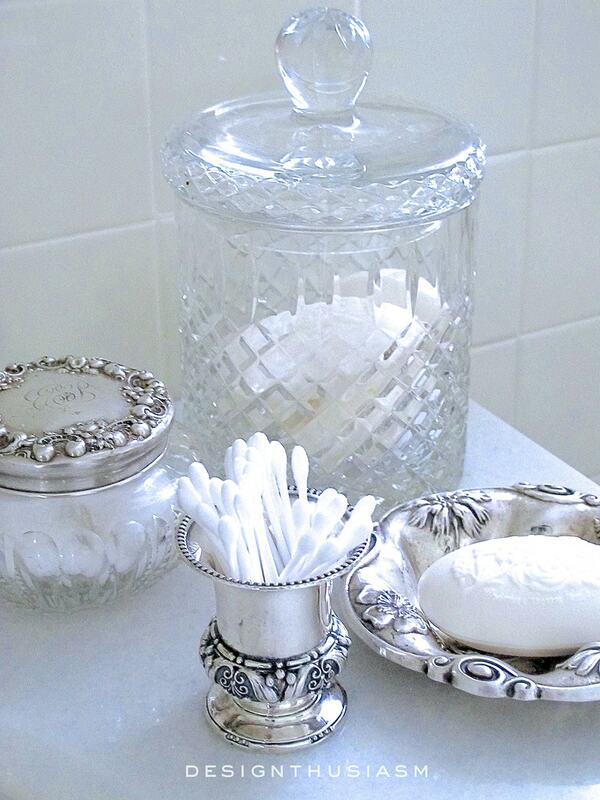 I love your new powder room….what a transformation! 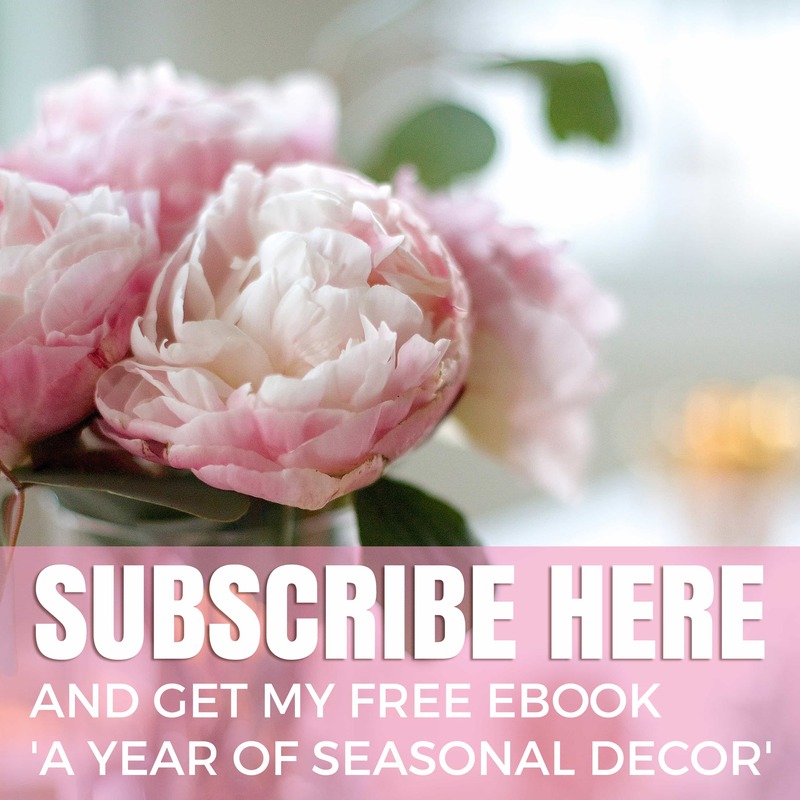 It reminds me of the one I did in my farmhouse….totally floral and Victorian! 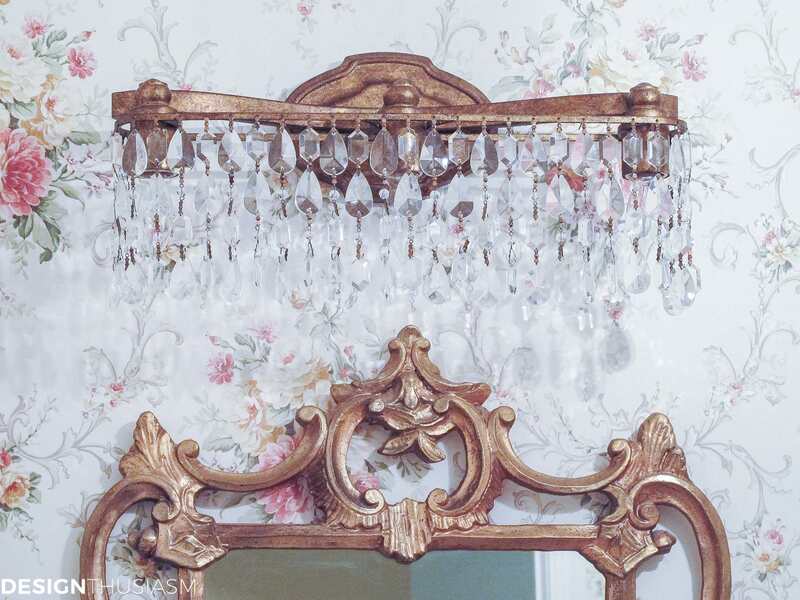 Everything in yours is perfect….that sconce above the mirror is to die for! A little animal print works too! Your powder room is simply stunning! 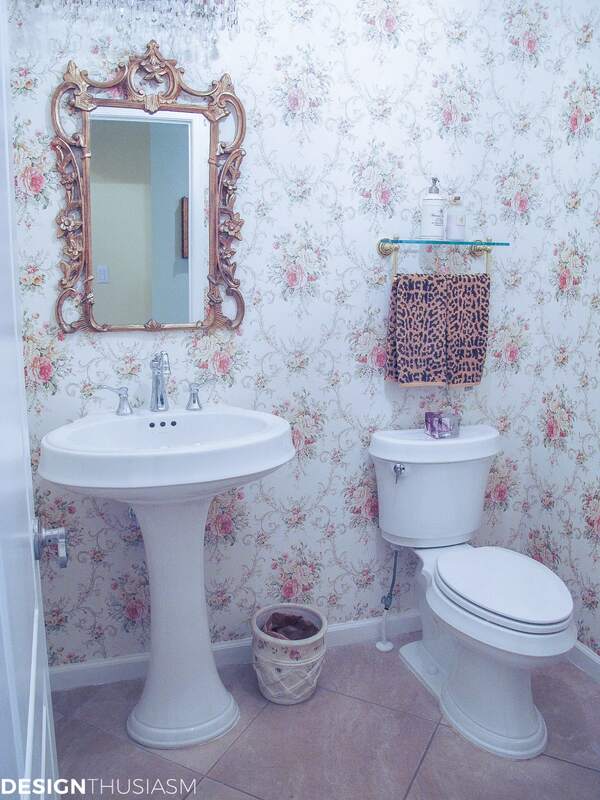 I love the sconce it’s gorgeous…..
I’m not a fan of pedestal sink either, I think I would have added a pleated skirt. Thank you for all the lovely ideas! I have almost the same exact builder grade bathroom, just flip the sink and toilet. Mine is white instead of black. I was wondering what wallpaper would look like in there, now I know. It wraps the room in a lovely warmth. Love your choices: mirror, lighting, towel, everything, and that table is beautiful. Great job! Thanks so much, Kimberly! I always think I’m the only person on earth who still thinks about wallpaper, but in a small bath, I think it really works. My initial thought was a classic single color toile, but when I saw this paper, it really spoke to me… 🙂 Thanks for stopping by! Love this transformation. The shelf is such a fabulous addition. Where did you find it? Thanks, Marty! 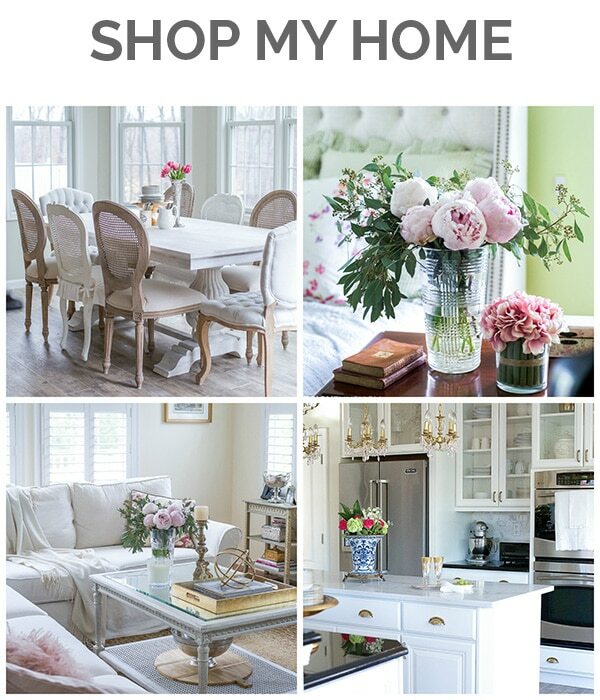 Actually, the shelf was one of my late night online shopping forays… 😉 It’s from Bellacor. Thank you! 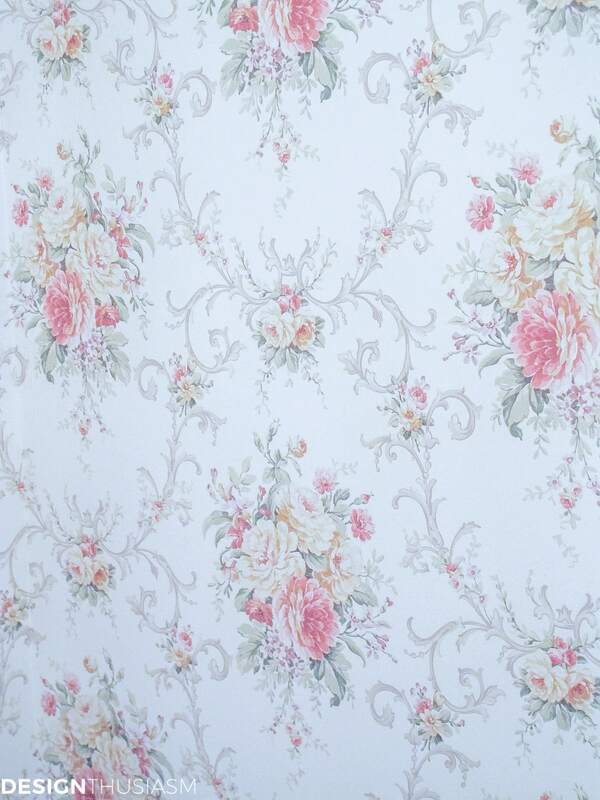 Yes, I ordered the wallpaper online through Interior Place (interiorplace dot com) and the style is Cream CA81401 Toile Floral Trail Wallpaper. Thanks for visiting! Every touch, every detail looks wonderful Lory!! What a wonderfully elegant room, I adore the light fixture over that stunning mirror. Makes me happy to know I was thinking like you. So similar to what I did in my powder room. Vintage looking floral wallpaper above a higher bead board wainscoting, bronzed antique design sconces either side of the gilded mirror. Antique chest and vintage lamp, heavy crochet lace trimmed hand towels. My art work is bridal handkerchiefs framed in narrow gilded frames. For my ‘jewels’ I padded the picture area of an ornate frame with black velvet. My pins and brooches are displayed there. It’s right off the entry, so is always on view – I don’t like closed doors. It is the only room where I used wall paper. Ah, Andrea, it sounds wonderful! Yes, I don’t like closed doors either, unless it’s a magnificent door with gorgeous gilded knobs… 😉 Thanks for stopping by! Oh, the bathroom is totally gorgeous! I love the pretty wallpaper too. Wow, I love, love, love it!! Yay for the wallpaper, no one wants to use wallpaper anymore! Everything looks fantastic, so Victorian! Where did you get that sconce? So cute! I love this bathroom! So pretty! And the wallpaper is to die for! ? Also, your soap dispenser is so much fun! Do you mind telling me where you found it? Thanks! ? 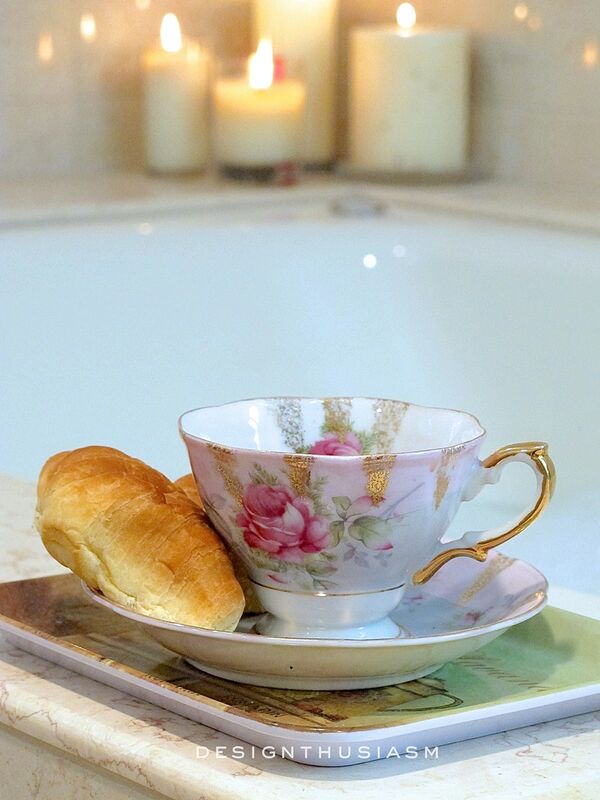 Your bathroom is gorgeous, loved everything you did…. What a change from the other blah design……………. Thanks you so much, Nellie!! So nice that others appreciate that same things I love… 🙂 Thanks for visiting! BEAUTIFUL!! Love the wallpaper and LOVE the lighting!! I love everything about this bathroom, Lory! The wallpaper & light fixtures are fabulous and so is that cute little shelf. 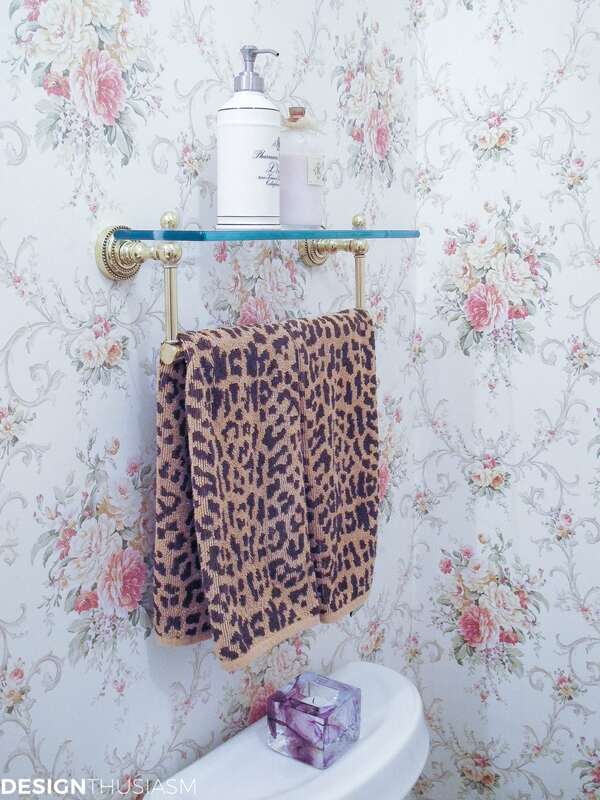 I also think the leopard towels add a bit of whimsy, so I would definitely leave them be! Great job! Thanks, Joi! I do agree about the leopard taking it a bit out of the fussy realm. I think I’ll switch them up from time to time – got some monogrammed ones, but will cycle the leopard in sometimes too… 🙂 Also have leopard paper hand towels which are the ones people actually use. Need to find a spot for them, though. A great improvement over the “before!” I would love to be one of your guests so I could feel pampered in that powder bath! You have so many lovely details! Do you make those changes yourself, or do you have a handy hubby? I do all the shopping… 😉 Does that count? Most of the hanging is done by a handyman. Hubby is actually really good at hanging – very precise and meticulous. But he doesn’t usually have time and I get impatient. The one thing I do myself is paint pretty much anything that isn’t nailed down gold. I also love to resurrect old pieces – old sliver and brass – that I find in antique shops. I love to shine them up and bring them back to life. And I re-beaded (with jewelry wire) the vintage chandelier in my kitchen. But my talents are generally more design and styling than DIY. How pretty and boy, what a difference! 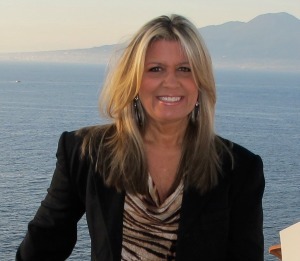 FIY: My sweet daughter-in-love nearly burned down their home with a lighted votive under her towel rack. Pretty sure that you move the gorgeous votive when you light it though, right? Thank you and you have no idea how resonant that comment is! Yes, I do move it now, to the little table in the corner. But, I learned the hard way because in our old home, I had a votive under a glass shelf (but without the towel bar). I thought it was easily far enough from the shelf, but one holiday after having the candle lit all night, I noticed the shelf had broken off about 3″ from the end. Never heard it break or anything, but sure enough, part of the shelf was gone! Fortunately there were no towels so nothing caught fire, but a lesson was learned nonetheless! Thanks for visiting! !